In 1801 he was elected as the third US President and was reelected in 1805, the highest American until the year 1809. During this time he laid down an extensive wine cellar with mainly French cult wines, such as the top wine estates Château Latour and Château Lafite-Rothschild on. From second, scored a bottle of the vintage in 1787 from his possession at a auction in December 1985 Christie's a fantasy price. The property of the German rarity collector Hardy Rodenstock (1941-2018) bottle was 105,000 pounds (175,000 dollars) to the American publisher Malcolm Forbes (1919-1990) auctioned. Another wine from Jefferson's possession was one Château Margaux 1787, offered for $ 500,000, but never sold. Thus he would be to most expensive wine in the world (see there in detail) has become. Today still available Werinflaschen from its former possession bear mostly the incised into the bottles initials "Th: J". 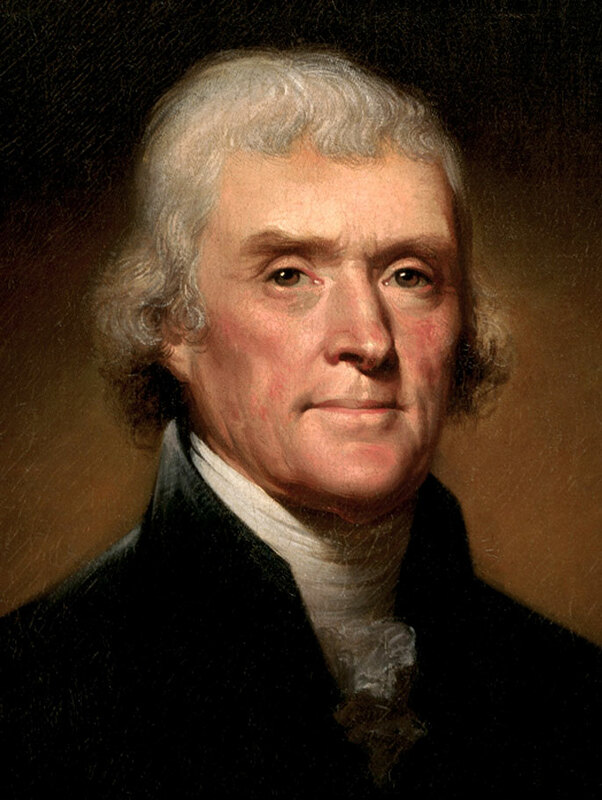 Jefferson had high regard for agriculture throughout his life and worked from 1770 on his estate Monticello in Virginia Intensive viticulture for over 30 years. He also had a moral motive, because he was convinced that only by appropriate wine culture and enough quantities of wine could discourage the Americans to consume stronger alcoholic beverages. He wrote: "No nation is drunk, where the wine is cheap. This is the only antidote to the deadly poison whiskey " . This was supported by a law in 1791. All alcoholic beverages were subject to an excise tax, with the exception of American-made wine. He experimented with imported ones again and again cuttings from Europe and appointed as estate manager Anthony Giannini (1747-1824), an Italian from Tuscany. This one was with Philip Mazzei (1730-1816), who planted the first Virginia vineyards with his neighbor and friend Jefferson. But all attempts with European cuttings failed, they were all of the phylloxera destroyed. Later, Thomas Jefferson tried to accept the peculiarities of American vines. He now tested numerous native American vines and encouraged many others to do so. In a letter he reports in 1783 in detail about a wine from the species Vitis vulpina, In another letter he expresses himself in 1817 about one from the Scuppernong produced wine very positively. With John Adlum (1759-1836), the variety Catawba in Ohio was the first to grow, he had regular correspondence and received from this in 1823 a wine pressed from it. His dream to make the USA a top wine country, but fulfilled his life not. This page was last modified at 6 January 2019 at 11:51.